Want to know how to save yourself some time this school year? Print out one of these get to know my teacher free printable questionnaires! For about 2 and a 1/2 years I served on our elementary school’s PTO board, mostly as president. It was a lot of work, but it showed me how hard those teachers and staff worked on our kids behalf and gave me a whole new appreciation for them. My favorite week of the year was teacher appreciation week. I love to spoil my kid’s teachers. It makes it a lot easier to do said spoiling when you know what they actually like. 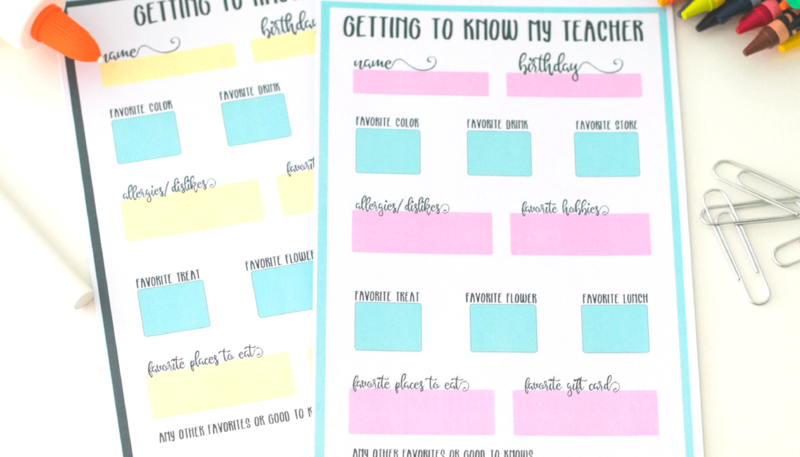 Handing out these printable Get to Know My Teacher questionnaires made our lives so much easier as we were planning out our teacher appreciation week. 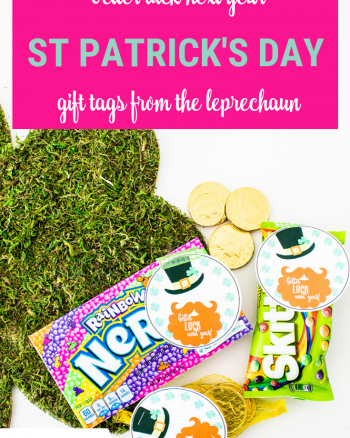 It also makes Christmas, Valentine’s Day and any other day when I know they might appreciate a little treat so simple! Every year one of my kids has a male teacher…and they are typically harder to buy for, but with this card tucked away at home, I know I can grab his favorite candy bar or drink and brighten his day. 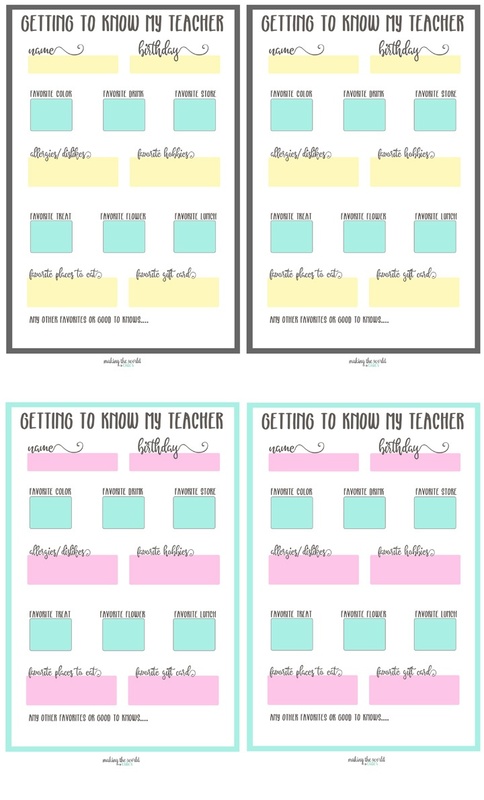 You can print either the pink and green or yellow and green (a little less feminine) and get to know your teachers quickly! Give them this in the first few weeks of school along with a new Sharpie marker and ask them to fill it out when they have a minute. 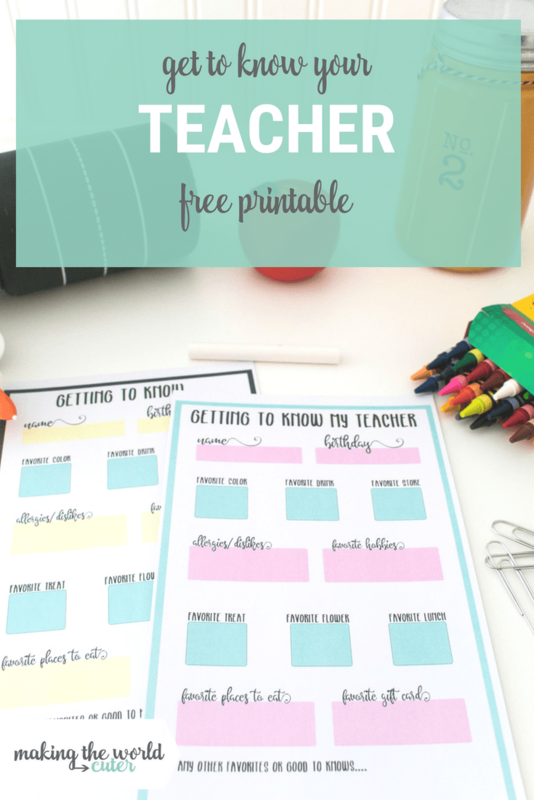 I have a LOT of teacher appreciation gift ideas and free printable cards here on Making the World Cuter, so be sure to check them all out if you like to spoil your teachers too!